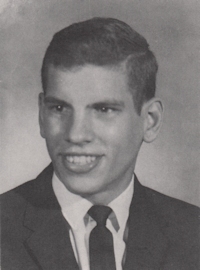 Obituary – Schmidt, Curtis Ivan « Perry High School Alumni Association, Inc.
Funeral service for Curtis Schmidt, 56, will be Saturday, July 3, 2004 at Timberlake High School Auditorium in Helena at 10:00 A.M. with Rev. Brantley Tillery officiating. Burial will follow at Good Hope Cemetery south of Helena with arrangements by Lanman Funeral Home, Inc. of Helena. The family will be at the funeral home for visitation on Friday from 7:00 P.M. until 9:00 P.M.
Curtis was born on June 15, 1948 in Enid, the son of Noah Ivan and Lillian Faye Jantzen Schmidt and passed away Wednesday, June 30, 2004 at St. Mary’s Regional Medical Center in Enid. He was a 1966 graduate of Perry High School and a 1986 graduate of Jay’s Truck Driving School of Springfield, Missouri. He had completed various oil field related seminars and was an honor graduate of the United States Army Small Arms School. Curtis had lived his entire life in northwest Oklahoma and had made his home in Helena since 1987. Curtis was a member of the National Guard in high school, and then after high school he joined the United States Army. He served two years in Germany as a mortar crewman in an armor company. He and Coetta Kay Murrow were married in Alva on June 9, 1979. During his life, Curtis worked in trucking, the oil field and for 15 years has been with Crabtree Correctional Center in Helena being a counselor for 10 of those years. His hobbies included building model airplanes, working in his water garden and doing home repair and woodworking. He especially enjoyed reading, dancing and being with his family. He was a member of the United Methodist Church of Helena. He is survived by his wife, Coetta of the home, his parents, Lillian and Noah Schmidt of Sedilia, Kentucky; six children, Roy and Reada Glenn and Joel and Shelley Glenn all of Wichita, Kansas, Dottie and Bill Sprague of Tahlequah, Katie and Victor DeLeon of Mesquite, Texas, Scott and Michelle Schmidt of Ringwood, Amy and Tim Mayfield of Isabella; thirteen grandchildren; one great grandson; two brothers, Rusty and wife, Yvonne Schmidt of Wingo, Kentucky and Rocky Schmidt of Waukomis; two sisters, Sandy and husband, Richard Fitzsimmons of Cleo Springs and Penny and husband, Tony Koehn of Sedilia, Kentucky; numerous nieces, nephews, friends and loved ones. He is preceded in death by one son, Curtis Ivan Schmidt, Jr.; one brother, Michael Schmidt and one great-nephew, Kristofer Fitzsimmons. Memorials may be given to the United Methodist Church of Helena or Oklahoma Medical Research, heart, cancer, or diabetes division through the funeral home.